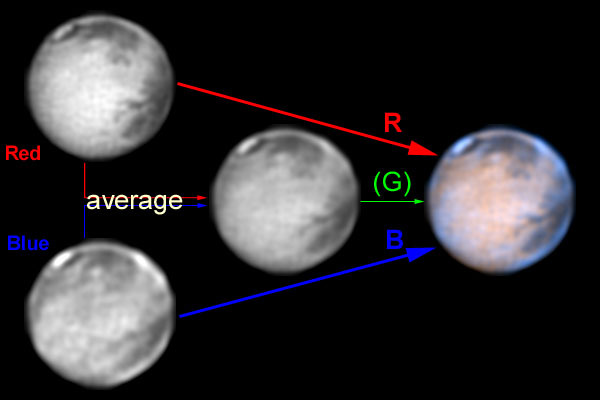 The conventional way of producing "true-colour" RGB images with cooled-CCD cameras used for astronomical work is to sequentially grab three grayscale components obtained with Red, Green and Blue coloured filters, and then combine them together using software like Adobe PhotoShop or the Win95 version of SBIG's CCDOPS. This procedure gives very good results both for deep-space objects and planets. "True-colour" RGB images are conventionally obtained by combining R, G and B components. These components are actually grayscale images, and are here shown with the respective colours just for illustrative purposes (as they would be seen through an eyepiece). Planetary imaging and observation routines, however, determine specific problems that need to be properly solved in order to get the most useful information to be obtained as fast and as often as possible. On one hand, planets do rotate (sometimes quite rapidly), which means that the three coloured components need to be obtained very fast in order to prevent heavy misalignment between the R, G and B channels. On the other hand, nights with adequate seeing conditions are usually quite rare events, which dramatically decreases the number of useful imaging sessions where data from the three filters can be obtained rapidly enough. 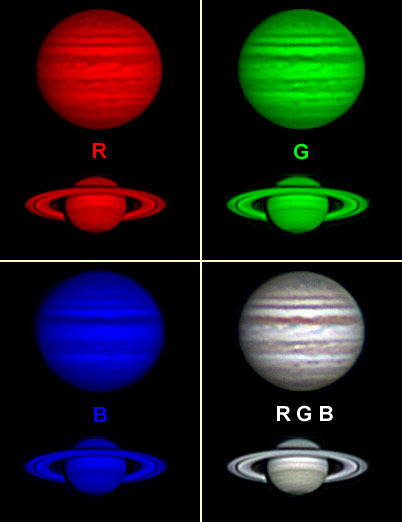 Planetary observers know for a long time that the most useful information originates from just two of the the above mentioned filters, namely Red and Blue. Red-filtered images are quite relevant to provide surface data (e.g. Mars), or to see "deeper" into the atmosphere of gaseous planets (e.g. Jupiter or Saturn). In turn, the Blue-filter shows plenty of atmospheric details on planets like Mars (e.g. clouds and hazes) and allows us to visualize "higher" cloud structures on gaseous planets. In short, Red and Blue filters provide complementary information while the Green filter just stays somewhere "in between" the other two. Fortunately, it is also known that by properly combining Red and Blue images it is possible to synthesize a "Green" component that is suitable to prepare "true-colour like" R (G) B images. Thus, no need to waste valuable observing time attempting to get non-essential (Green) frames. It is better to use that time trying to obtain more raw Red and Blue images to process. The signal-to-noise ratio of the final images will be better! I now routinely obtain such Red-Blue "tri-colour" images in my planetary observation sessions. In other words, I just stopped to grab Green-filtered planetary images! Red-Blue "tri-coloured" images are just obtained from R and B component images. These are averaged to produce the third "synthetic" G frame that is needed to obtain a "true-colour like" appearance. 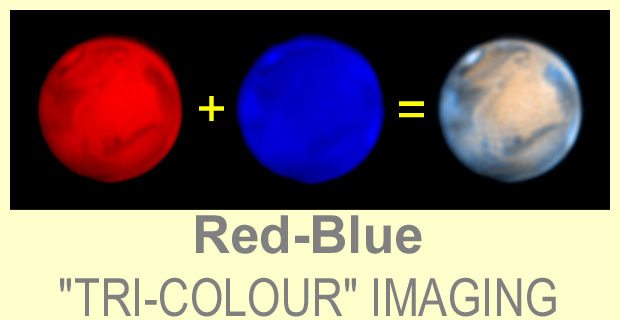 As for the "super-resolution" procedure I apply to planetary imaging, Red-Blue "tri-colour" images can be obtained with software like CCDOPS (e.g. "average" and "RGB combine" commands). I continue to use CCDOPS for DOS to prepare (e.g. crop, sharpen, co-register) the original filtered frames, but use CCDOPS for Win95 to produce R-B images. Red and Blue images to be averaged do not need to be obtained with the same integration times. They also do not need to originally have similar "back" or "range" parameters. However, it is important that they will have the same "weight" in the averaging process. In other words, each component should contribute 50% to the "Green" image to be synthesized. That is very simple to achieve. First check the background value of the sky near the planet's limb, using the crosshairs ("show crosshair" command in CCDOPS), and ascribe it to the "back" parameter of the image display. Then activate the image histogram ("show histogram command in CCDOPS) and modify the "range" value of the image until the brightest pixels of the image reach the rightmost extremity of the histogram. However, always avoid image saturation. It is now possible to "scale" our image ("scale" command of CCDOPS; "Log" option set to "no") in order that the chosen "Back" and "Range" values correspond to "0" and "65535", respectively. This image is saved, and the procedure is repeated to the second filtered image. This step assures that the two filtered images will equally contribute to the "Green" channel image. 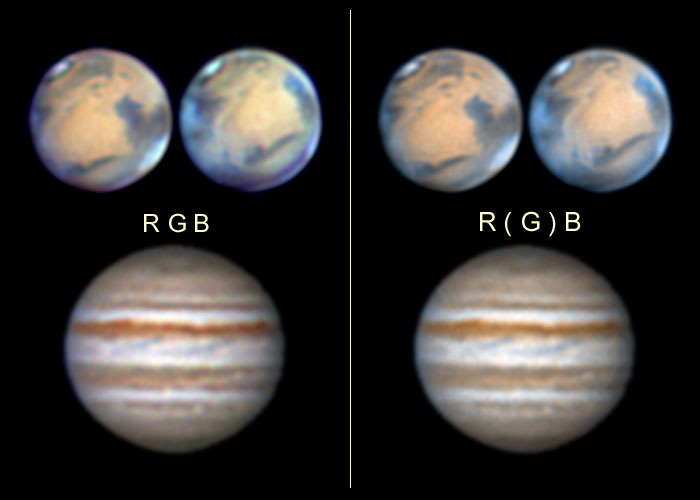 A comparison between genuine RGB images of Mars and Jupiter (left), and the results that are obtained after synthesizing a new Green component by averaging the same original Red and Blue frames (right; original Green component discarded). In my opinion, the R(G)B procedure illustrated on the right provides the same information that genuine RGB images do (left) and has several advantages: it is faster, has more colour uniformity between images and shows considerably less component misalignment. I now routinely use Red-Blue "tri-colour" images in my planetary observation sessions.